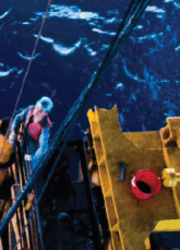 Industry leading corrosion protection – reducing the cost of equipment damage. -50 C to +180 C temperature range ? suitable for use in extreme environments. Pseudoplastic rheology – increasing penetration and ensuring far reaching protection. Specially selected carrier fluid – enhancing water displacement and penetration. Biodegradable, minimally toxic and non bioaccumulative – minimising environmental impact. 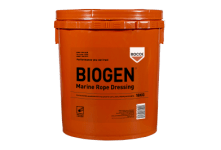 BIOGEN Spray is a high performance, environmentally considerate spray grease, ideal for use on wire ropes as well as winches, hoists, large chains, nuts, bolts and springs. It is designed to provide users with a high performance aerosolised grease, for us in extreme environments, whilst also minimising any environmental impact. BIOGEN Spray exhibits pseudoplastic rheology, and so any shear or agitation causes a reduction in dynamic viscosity of the grease, allowing maximum penetration between strands and into cavities. This technology helps provide industry leading corrosion protection, guarding wire ropes and other equipment from the onset of corrosion. Corrosion is a primary cause of equipment failure in most extreme environments. During ASTM-B117 salt spray tests, the lubricant provided in excess of 1000 hours protection against corrosion, industry leading results. The grease film provided by BIOGEN Spray has a temperature range of -50°C to +180°C and BIOGEN Spray is therefore well suited for use in extreme environments. 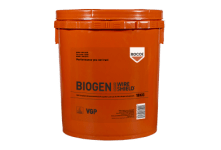 The biodegradable carrier fluid, specially selected for this formulation provides both enhanced de-watering and penetration properties making BIOGEN Spray particularly suitable for use in wet conditions. 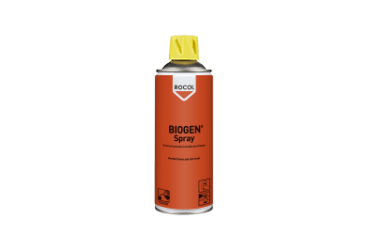 BIOGEN Spray is quick and simple to apply, not only saving valuable time and labour, but also reducing the amount of lubricant waste, especially on applications requiring a small amount of lubricant. The spray has a 5 mm mini-jet extension, which gives excellent directional spray and precise lubrication when used close up, as well as a very even spray pattern and coverage when used at distance.